Pay only P 5,743 a Month for 12 months. Or pay only P 10,876 a Month for 6 months. 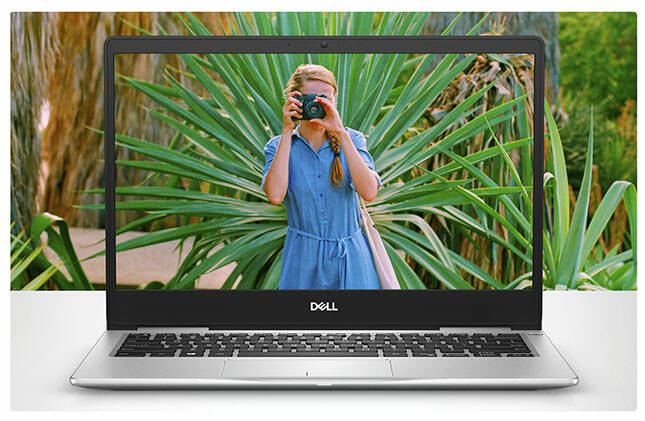 Beauty made brighter: The elegant, thin-bezel design gives you added screen space for those gorgeous visuals, while the Full HD IPS display (with available touch option) lets you view your screen from a wide range of angles without sacrificing image quality. In addition, a stunningly bright 300-nit panel makes working outdoors easier and streaming more enjoyable. It sounds like this: Waves MaxxAudio® Pro delivers professional-grade sound, completing your immersive experience. It automatically tunes your audio with clearer highs, enhanced bass and increased volume so everything you hear sounds exactly the way it was meant to. Superior streaming: Experience enhanced online streaming and interactive video thanks to SmartByte technology – a network solution that ensures your most important applications get the bandwidth they need for optimal performance. Power play: The latest and most impressive Intel® 8th Gen Quad Core processors with Intel® HD graphics let you open up the throttle and finish every project and every streaming marathon with speed and performance to spare. Multi-tasking made easier: Up to 16GB DDR4 memory means larger bandwidth and faster load times. Additionally, switching between applications is a breeze, even while running multiple programs simultaneously. 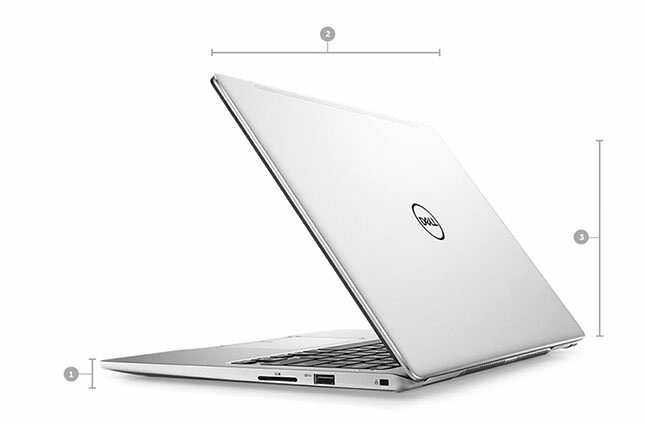 Revolutionary responsiveness: With 256GB SSD standard and an optional 512GB PCIe NVMe M.2 SSD, the Inspiron 13 7000 features lightning-fast responsiveness, making everything you do faster, smoother, and easier. Available with Windows 10 Home – Get the best combination of Windows features you know and new improvements you’ll love. Designed so you can do more. Bend it to your will: A 180-degree hinge lets you lay your screen flat, making it easier to create and collaborate, or sketch and take notes seamlessly with an active pen2 (available only with touch option). Secure sign-in: The available touch option features a built-in infrared camera works with Windows Hello for secure facial recognition, allowing you to log in with just one look. 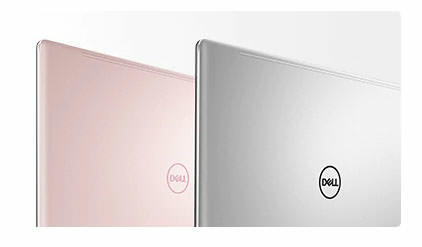 Or skip sign-in altogether with the ultra-secure and easy-to-use fingerprint reader featured on the power button. Lightning-fast charging: Get your system running in no time with the Quick Charge Battery. You can go from zero to ready in no time. 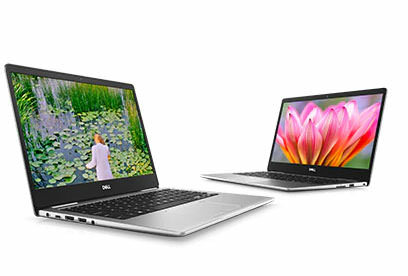 Thin and light: The Inspiron 13 is the thinnest laptop of its kind, and its lightweight frame makes it ideal for carrying on the go. 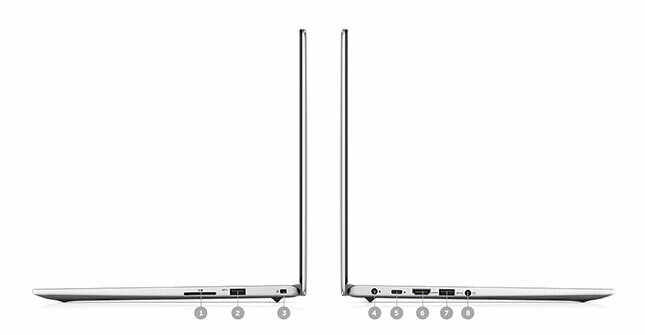 Convenient connections: The latest USB 3.1 Type-C port allows universal charging, as well as a DisplayPort for connecting to ultra-high resolution external displays. An HDMI 2.0 port allows videos to be played up to 60 fps with support for an external 4K UHD display. Illuminate your work: A backlit keyboard lets you type conveniently in dim light. Pink Champagne: Add a bright, energetic, sophisticated pop of color to your day-to-day with a pale pink that perfectly complements every adventure. Platinum Silver: Brilliant diamond-cut edges and a brushed-metal surface add a touch of sophistication for a sleek, upscale look and feel. *The config runtime is subject to regional assortment of system with the above-listed components. *This feature may vary by SKU and country. Kindly refer in the Technical Specifications section. **Actual battery life may vary depending on application usage, settings, features or tasks selected, network configuration, operating temperature and many other factors.